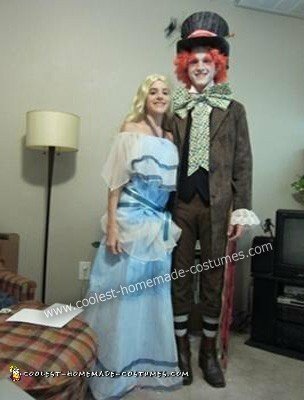 I made these DIY Shrunken Alice and the Mad Hatter couple Halloween costume out of mostly thrift store finds and household objects. I got the idea for the costumes from Tim Burton’s Alice in Wonderland. I enjoy making detailed costumes for Halloween and figured that these characters would me challenging enough. And I had not seen anyone attempt a shrunken Alice costume yet. For the Shrunken Alice costume I found a white “mother of the bride” dress at a thrift store, painted it blue and added the ribbon trimming. I also made the sash out of a light and dark blue ribbon hot glued together. I cut a small hole in the neckline to loop the ribbon that would hold the dress up. For the Mad Hatter costume I made the hat with a cowboy hat and old lamp shade. I covered the cowboy hat in crushed green velvet, then the lamp shade and glued them together (I tried covering the whole thing at once, but it’s easier to wrap them separate). The sash is a fabric remnant and the hat pins are knitting needles with painted tin foil for the stones. I also attached patches of fabric from around the house. 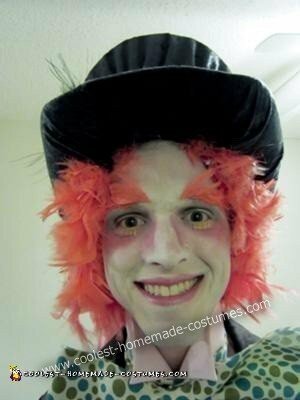 The hair is a feather boa folded in half and glued to the brim of the hat and the eyebrows are feathers from the boa held on with spirit gum. The bow-tie is made from regular cotton fabric from the craft store. I used clear packing tape to hold the shape and made a single large loop. I then made a cuff to go around the large loop to make the center of the bow. I cut two long strips and glued them to the back to make the long ribbons. We held the bow on with Velcro. The jacket I found at the thrift shop. It was originally black and very large. I painted it roughly with a light brown color and sewed up the back to make it fit better. I hot glued ribbon remnants from the craft store and a scarf from the thrift store to the pockets and glued lace around the cuffs. The pink shirt and tie are from around the house, as are the pants, socks and shoes. The sash I made by weaving ribbon through several spools of thread.